One of my favorite dishes is shakshuka, for its many textures and flavors and the fact that my hubby makes it anytime I need a break! And that’s exactly what happened today since I was feeling a little under the weather by the time I got home from work—oh, the joys of working with kids that have every germ possible. It also turned out to be a perfect day for some Israeli food because I finally received my Israeli passport today! Even though I should have been resting in bed, I could almost hear the kitchen calling to me so I decided that while he worked on the shakshuka sauce I would do something to take this classic to a new level just in time for Purim. 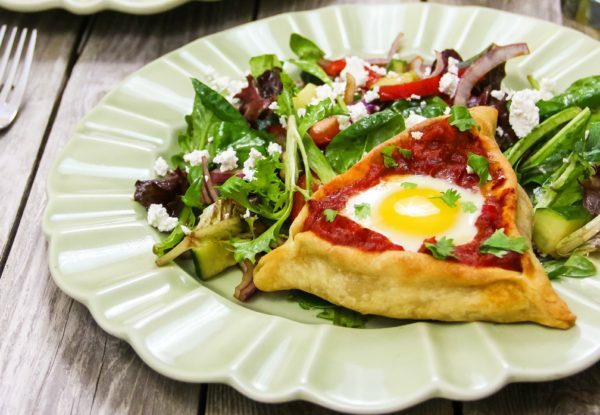 Presenting the shakshuka-in-a-pita hamantaschen! AKA the shakshukentaschen! Hamenshuka? Anyway, baking the shakshuka directly into homemade pita dough turned out so eggcellent, I can’t wait to add this to my regular repertoire year round! It even has some advantages over the original. Not only can you tailor the sauce recipe, but with individual portions, you can customize for each person’s runny yolk preferences! Combine smart balance and milk and heat in the microwave until butter is just melted. In a large bowl, combine flour, salt, butter and milk. Knead for a few minutes until it is smooth. Add extra flour if the dough is too sticky. Wrap with plastic wrap and rest at room temperature for 30 minutes. Cover your counter with flour, cut dough into 12-14 pieces and roll into balls. Cover the ones you aren't working with so that they don't dry out. Flatten each ball into a 1/4 inch thick rounds. Place the rounds onto a baking sheet directly. Spoon your favorite shakshuka recipe in and close up like a regular hamantaschen, making sure to seal the edges really well. Put into the oven and bake for 15-20 minutes, until the dough is starting to look golden and holding its shape. Remove from the oven and lower the oven temperature to 300 F. Using a spoon take out some of the sauce from the center creating a well, reserving it for later. Crack an egg into each one. I find it easier to crack an egg into a cup and then slowly tilt out some of the white into a spare bowl and then pour the remaining yolk and little bit of white into the center of your hamantaschen, otherwise it will overflow. 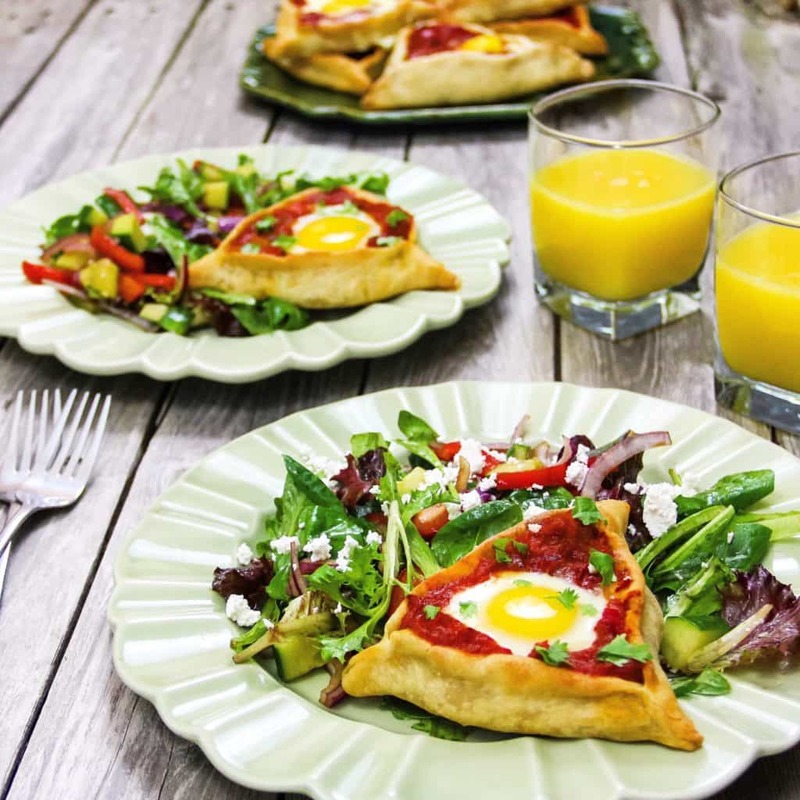 Place back in the oven and bake until the yolk is set just the way you like it. Garnish with torn parsley.